Trends are coming and trends are going. Pop art is in the air since some time now. Prada is showing a real pop art inspired summer collection and continues on that road for the fall, and they are not the only ones. Explosions of color were also present at the furniture fair in Milano, a few weeks ago. If we may believe the design and fashion world than happy and colorful times are ahead of us. In Milan, the city was filled with bold colors, playful installations. Pop art is trendy. Pop art was designed for young people. They focused on a mass audience, who wanted inexpensive furniture to decorate their mass-produced homes. Pop Art is an art movement which emerged in the mid 1950s, and got very popular in the United States and Great Britain in the 1960s. The artists would look for inspiration in the world around them, they would paint objects and people out of everyday life and were seeking to elevate popular culture to the level of art, blur down the boundaries between "high" and "low" culture. Pop art is very recognizable. Roy Lichtenstein and Andy Warhol are the best known Pop Art artist. After WWII there was a media boom. Magazines, newspapers, and the tv made that news would spread much faster than it ever did before. The world people were living in became bigger, the travel to the moon made it extend even more, New materials were developed. Polyester fabrics, plastic furniture, and canned food made the life of women much easier, as it was a time they also wanted a career and don't spend to much time in the kitchen. It were fun times. The 1960s was a time of consumption, a lot of cities had to be rebuild after the war. Young people would move to the suburbs. Life changed a lot in those years. The travel to the moon had also a big impact on design and it would inspire the furniture industry to work with round shapes, develop new materials and new manufacturing processes made it possible to sell furniture at much lower prices. Young people were happy to find furniture fitting their budget and their new lifestyle. You love colors and want to give your home a joyful touch? Go for bold colors such as yellow, red, blue. Mix stripes with dots, and add a Roy Lichtenstein or Andy Warhol poster. Mix it up. Comic books, bright colors, clear outlines, and his use of Ben-Day dots (small dots used to render color in mass-manufactured comics) make that the paining of Lichtenstein are easy to recognize. Lichtenstein blurred the distinction between mass reproduction and hight art by hand-painting the usually machine-generated dots. The funny thing is that his paintings afterwards were entering a lot of teenagers rooms as reproductions. Would you go for a colorful kitchen? Orange would be something for your taste? Go for it, it will for sure bring you in a happy mood in the morning. One thing I have to tell you: orange is a color which will increase your appetite, so take care. But I would only tell people to go for such a bold color in their kitchen when you know it won't be the apartment they will live in the next 20 years. It is a good option for your first home, a place where you will maybe live a few years before you get settled somewhere else. 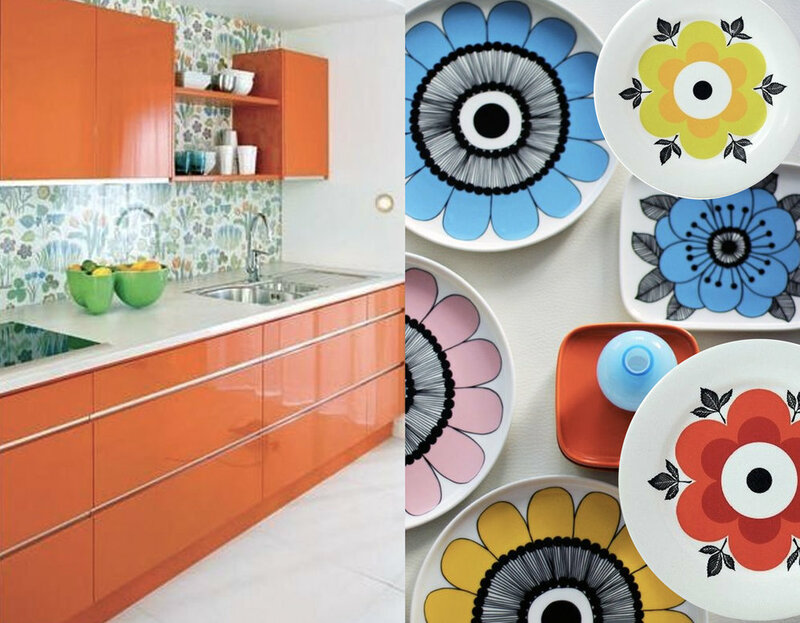 But there are a lot of options to bring color in your kitchen: the backsplash can be more colorful, paint one wall in a color, a big painting can make a difference, or look for some nice 1970s style plates. Look for inspiration at Andy Warhol, he found a lot of his inspiration in mass consumer culture. You will know for sure his Campbell's soup cans or his Coca-Cola bottles. He started painting but switched later to screen printing. Last year I was already writing about more color in the bathroom in another trend alert. We often think of bathrooms in white, neutral tones or we can still imagine to have some blue tones. Imagine yourself entering in the morning a colorful bathroom, how would you feel? I like the idea of the colorful shower enclosure. Summer will arrive soon, we will spend more and more time in the garden. Make it a fun summer, find inspiration in the pop art culture. It shouldn't be serious, don't be afraid to mix colors. Pop Art is something for you?